UPDATE: Dr. Dressler’s acclaimed Survival Guide is now included in his comprehensive Dog Cancer Kit! We’re only halfway done reading the hefty new print edition of Dog Cancer Survival Guide, but we’re so excited we couldn’t wait to share a few of our thoughts about this important book with you. The Dog Cancer Survival Guide has been one of our most highly-recommended reading materials since it was first published a few years ago. Today, we can’t emphasize enough how vital this revised edition is if you’re coping with canine cancer. Written in collaboration with Dr. Susan Ettinger, a board-certified oncologist in New York, this 400+ page textbook is jam packed with the latest information about conventional treatments and helpful holistic therapies that anyone with any budget can pursue. 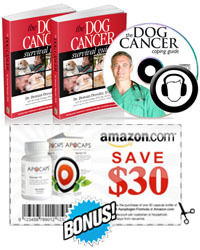 You’ll get a comprehensive description of different dog cancers and related treatments, as well as a thorough appendix filled with information about published dog cancer studies you can share with your veterinarian. Dog Cancer Survival Guide’s information is grounded in reality and doesn’t make any promises that it will cure your dog’s cancer. But Dressler’s strong sense of empathy and wisdom extends a guiding hand to readers that’s so desperately needed when faced with canine cancer. You’ll feel empowered, hopeful, grounded in reality and ready to face whatever comes next with the same Zen attitude as your canine hero. We’re not done reading the book just yet and we’ll have more to share with you later. For now we just couldn’t wait to tell you how impressed we are with Dressler and Ettiinger’s work. A big shout out goes to both docs for giving pawrents the layperson’s first authoritative, empathetic and hopeful tool available for coping with canine cancer. Be sure to check out our Dog Cancer Survival Guide e-book review in the Tripawds Downloads blog.